Your copies and prints will be made at up to 24 pages-per-minute for high-quality letter-size documents. A large supply of paper can conveniently be utilized from either the 500-sheet front-loading paper cassette or the 100-sheet multipurpose tray. The multipurpose tray can accommodate a variety of sizes and types of paper stock such as bond, plain and color paper, transparencies, labels and envelopes for special projects. Use the legal-size platen glass for single-page originals or the 50-sheet Duplex Automatic Document Feeder (DADF) for multipage originals. The benefit of DADF is that it allows you to copy, print, and color scan from one or two-sided originals and produce two-sided output. 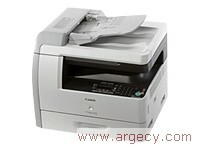 Built for reliability and ease-of-use, the imageCLASS MF6540, using Canon's exclusive Single Cartridge System, as well as years of fine-tuned copying and printing know-how, will attest to Canon's commitment to providing products with a level of quality and expertise that ensures your office runs effectively.